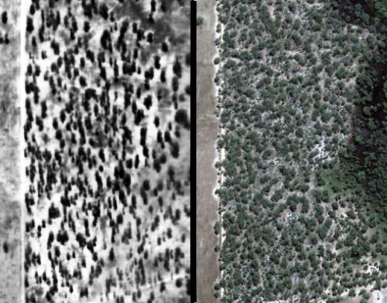 This month’s post is the second of the ‘Growback’ blogs, which show examples of natural regeneration across Victoria, by comparing air photos from the 1940s with recent images from Google Earth. Doctors Swamp in 1945. The left-hand photo is the ‘untouched-up’ original. I’ve removed the worst of the blemishes from the right-hand photo. Click on the image to see a larger version. This week’s Growback comes from a wetland near Murchison in central Victoria called Doctor’s Swamp. The reserve contains Grey Box (Eucalyptus microcarpa) woodland on high ground in the west and an intermittent wetland dominated by River Red Gum (Eucalyptus camaldulensis) in the east. The earliest air photo of the area was taken in 1945. In 1947, about 50 square air photos were ‘cut and pasted’ into a large photo mosaic that was itself then photographed to form a composite image of the region. The composite image contains lots of blotches and strange patterns that were created when photos of different shades were stuck together. You can see these blotches on the photo above. The red box on the left shows where a big blotch continues across an irrigation channel, so the blotches are definitely imperfections rather than real patterns. The right-hand photo is my Photoshopped version. I’ve removed the worst of the blemishes, but the edges of the original blotches are still visible. Other imperfections result from distortions along the edges of the original, small, square air photos. The red box on the right (above) shows a strip where everything is ‘stretched’. This strip must have been along the edge of one of the square air photos. Many of the old photos also contain pencil annotations. The black line to the left and below the word ‘Colbinabbin’ shows where a new irrigation channel was to be dug. The channel can be seen on the recent Google Earth images below. 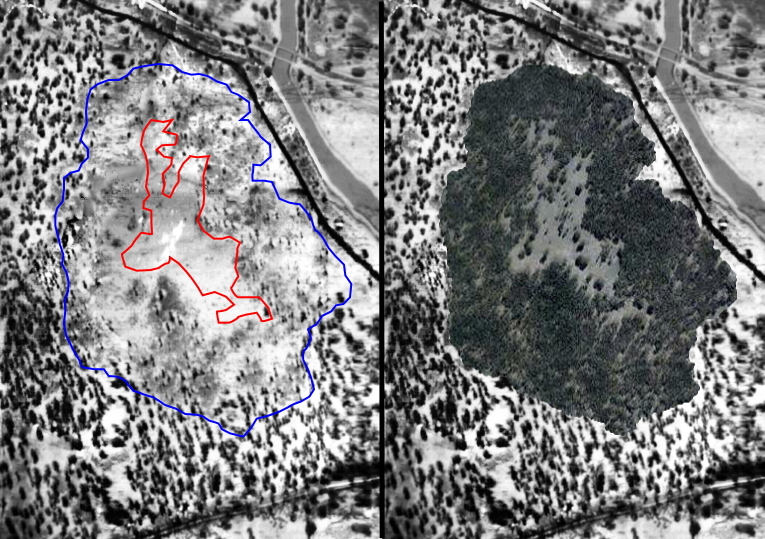 Imperfections aside, the old photo shows substantial changes in vegetation cover over the past 60 years. The woodland and the wetland have both ‘thickened up’ considerably. This may be due to the same process, or perhaps to different processes, in each ecosystem. Doctors Swamp in 1945 and 2006, courtesy of Google Earth. The northern water channel is shown in pencil on the early photo. Click on the image to see a larger version. Like much of Victoria’s vegetation, the dry woodland was relatively open and the ground was very bare in 1945, as can be seen below. Nearly all areas of public land were grazed heavily by livestock and rabbits in the 1940s, and the paucity of ground plants is probably due to grazing. Trees and understorey shrubs are more abundant now. The south-west corner of the reserve in 1945 and 2010. The ground was very open in 1945. The woodland understorey resembles many dry woodlands in the region. The dominant shrub is Cassinia arcuata (Drooping Cassinia or Chinese Scrub) and native grasses and herbs provide a sparse ground cover. From the photos above, I’d be confident that – by any measure of vegetation condition or ecosystem ‘health’ – the woodland is in better condition now than it was in 1945. The south-west corner of Doctor’s Swamp in 2008 (Photo by Toby Grant). The wetland area shows a different change. In 1945, the central wetland was dry, open and contained few trees, as shown below. 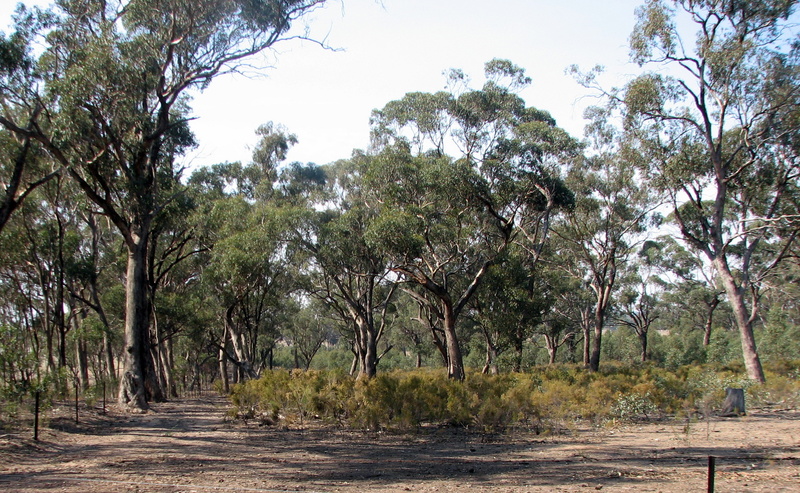 By 2006, River Red Gums had regenerated densely around the wetland fringe. Thus, the swamp has changed from a large, open wetland with sparse fringing trees, to a much smaller, open wetland surrounded by dense young eucalypts. 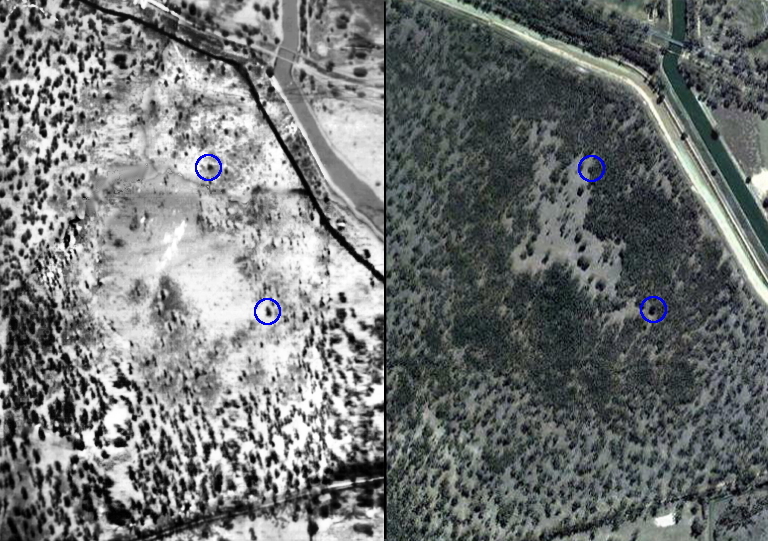 The intermittent wetland area in 1945 and 2006. The blue circles show two trees that can be matched across both photos. River red gums have regenerated densely since the 1940s. With some digital wizardry, we can overlay the boundary of the dense tree zone on the old air photo to highlight the change. The central wetland area was almost completely bare in 1945, and had few trees in 2006. Red gums regenerated densely on higher ground surrounding the central wetland, where there were few trees in 1945. Another view of the wetland area, with the boundary of the dense tree zone overlain on the 1945 area photo. It’d be interesting to know why the wetland had so few trees in the 1940s. There are two options: trees may have been chopped out earlier on, or the wetland may naturally have been open and treeless. Large red gums can cope with seasonal flooding, but seedlings die if flooded for many months. If the wetland used to be flooded more frequently (or for longer periods) than it is now, then this may explain why the area had so few trees initially. It’d be simple to work out which option is most likely: just hunt for old tree stumps. If the wetland was originally timbered and trees were chopped out, then large old stumps should be easy to find. Red gum timber decomposes slowly, and 100-year old stumps would still stand strong. Unfortunately I didn’t hunt for stumps when I visited Doctors Swamp (I hadn’t seen the old air photos then). Right now, it’d be hard to find old stumps, for a reason I’ll disclose in a moment. Hopefully an enthusiastic reader may be able to visit the wetland, and post a photo or a comment below to resolve the mystery. I like the fact that different patches of regeneration in the one reserve may be due to different ecological processes: removal of heavy grazing and changes to flooding. It highlights that passive, natural regeneration by native trees and shrubs can be promoted (and prevented) in many different ways. So why didn’t I rush out and hunt for stumps at Doctors Swamp before posting this blog? Over the past decade, south-east Australia suffered a major drought, which is why the wetland was completely dry in 2006. But in 2010 the rains returned, flooding the wetland and many others for the first time in many years. Google Earth has a great image of the wetland at its finest, in 2010. An iridescent flush of lush aquatic plants carpets the reserve. When it all dries out, I’ll happily go hunting for stumps, but in the interim, it’d be more fun to splash about and enjoy the water birds. What a difference some rain makes. The dry wetland in August 2006 (left) and flooded in December 2010 (right). Both images from Google Earth. Click on the picture to see a larger version. If you know this area well, please post a comment to add to the story. Good to see the bush coming back. I could be wrong but I imagine the fauna mix is now quite different to what it was pre white settlement. Would you expect this to be reflected in the flora mix as well? I’m thinking of the role fauna plays in the distribution and germination of certain seeds. Its worth noting the periods before the 1945 photo, & the 2006 or 2010 photo are arguably the two worst droughts experienced since european settlement, suggesting seasonal differences as an influence on veg structure then and now is not a key factor. I’m told by locals that grazing occurred on the site up until the 1980’s, although probably not as intensively as earlier in the 1900’s, so grazing may be of some influence. What strikes me is that the tree density on the drier areas doesn’t seem to have thickened to the same level as on the wetland edge. Maybe a gradually drier climate (if indeed this is the case) has allowed relatively more recruitment opportunities to occur on the wetland fringe, as opposed to the dry woodland and true / central wetland? A bit like the rising treeline in the alps? I’ve driven past this site many times and recognised it quickly even from the first set of photos. I went through there recently after not having visited the area for about two years and thought that there was much more chinese scrub in the surrounding farmland than I had previously noticed. Hi Ian, I was interested in seeing your report after it was passed on by some friends. I have lived close to Doctors most of my life and I was wondering if you may like to talk to some locals who use to graze this are and have some historical insight into the site. I am more than happy to help set this up if you think it could be beneficial to your research. Great discussion. I’m not sure I totally agree with the idea that the increase in vegetation cover revealed by the two images indicates and increase in vegetation health. Like you mentioned most of this vegetation cover is Cassinia arcuata, which is not a ‘natural’ component of Red Gum swamps in the region, purely because it is usually too wet. My take on the site after a visit in 2010 was that the Cassinia had invaded the site due to the long-term drought. I would be guessing that most of it is dead by now but has anyone been there more recently? I wonder if stock grazing might have prevented this invasion during past droughts but not sure if stock would graze Cassinia? Similar for Eucalypt recruitment, mass germination of Red Gums within the floor of a wetland is commonly considered signs of altered process such as significant drying. I see the structure of the wetland in 1945 resembling a more ‘natural’ state of an old growth Red Gum swamp, where frequent and prolonged flooding restricts recruitment of woody species. But who knows what the understorey floristics looked like; probably stock grazing were hammering the groundflora more back then, particularly during droughts. Concerning the latter poll about appropriate sampling I would have thought that seasonal timing would be more important when comparing groundflora diversity rather than the structural attributes such as you were comparing. I know a few botanists who surveyed the site quite a lot during 09-10 and were really impressed with its recovery after the drought. I’ll see if they are up for posting a comment. Thanks Ian, Damien and Dylan were who I had in mind 🙂 I thought I remember seeing the Cassinia inundated….it was kinda weird seeing amongst all the water and aquatic plants. Look forward to seeing more discussion.